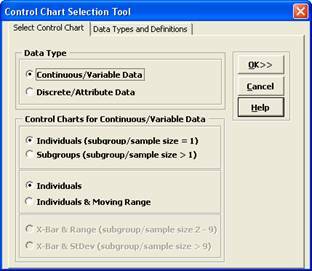 The Control Chart Selection Tool makes it easy for you to select the correct statistical process control chart depending on data type and subgroup/sample type and size. Continuous/Variable: Data that is measured on a continuous scale where a mid-point (or other subdivision) has meaning. For example, when measuring cycle time, 2.5 days has meaning. Other examples include distance, weight, thickness, length and cost. Customer Satisfaction on a 1 to 5 scale can be considered as continuous in that a satisfaction score of 3.5 has meaning. Continuous data is always in numeric format. Discrete/Attribute: Data that is categorical in nature. If we have defect types 1, 2, and 3, defect type 1.5 has no meaning. Other examples of discrete data would be customer complaints and reasons for product return. 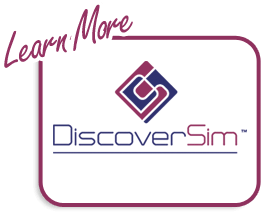 Discrete data can be text or integer numeric format. Defective: An entire unit that is nonconforming to customer requirements. A unit may be defective because of one or more defects. For example, an application form is good only if all critical entry fields are correct. Any error in a critical field is a defect, resulting in a defective form. A single form can have more than one defect. Defect: Any specific nonconformity to customer requirements. There can be more than one defect per unit or area of opportunity, such as the entry errors described above. 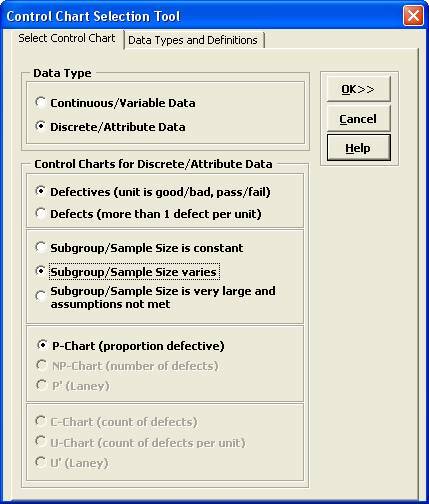 Subgroup/Sample: Data for a subgroup are usually collected within a short period of time to ensure homogeneous conditions within the subgroup (common cause variation), in order to detect differences between subgroups (special cause variation). Subgroup/Sample Size: The number of observations within your sample, not the number of samples. Subgroup sizes of 3 to 5 are common for continuous measures in parts manufacturing, while individual measurements are common in chemical processes (temperature, pH) and transactional areas (financial). Subgroup size for discrete data should be a minimum of 50. Subgroup/Sample Size is constant: The number of observations within your sample remains fixed over time. Subgroup/Sample Size varies: The number of observations within your sample varies over time. Subgroup/Sample Size is very large and assumptions not met: This applies to discrete data when the subgroup sizes are approximately 5,000 or higher and the control limits do not “look right,” being very tight with many data points appearing to be out-of-control. This problem is also referred to as “overdispersion”. This occurs when the assumption of a Binomial distribution for defectives or Poisson distribution for defects is not valid. (Note: If the problem of overdispersion is apparent with your continuous data, use SigmaXL > Control Charts > Advanced Charts > I-MR-R or I-MR-S). Open Customer Data.xlsx, click on Sheet 1. 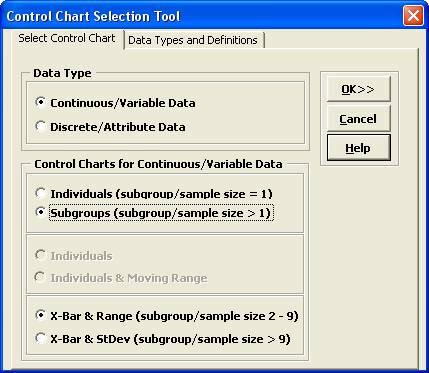 Click SigmaXL > Control Charts > Control Chart Selection Tool. Click OK. This starts up the Individuals Chart dialog (see Individuals Charts for continuation). Open the file Catapult Data – Xbar Control Charts.xlsx. Each operator fires the ball 3 times. The target distance is 100 inches. Select B2:F22; here we will only use the first 20 subgroups to determine the control limits. 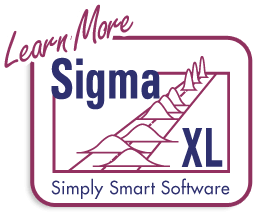 Click SigmaXL > Control Charts > Control Chart Selection Tool. Click OK. This starts up the X-Bar & Range dialog (see X-Bar & Range Charts for continuation). Open New York Daily Cycle Time – Discrete.xlsx. This is data from the Sigma Savings and Loans Company, New York location. Each day, the cycle time (in days) for completed loans and leases was recorded. N indicates the number of loans counted. A Fail was recorded if the cycle time exceeded the critical customer requirement of 8 days. Click OK. This starts up the P-Chart dialog (see P-Charts for continuation).